Copier repair is an essential part of your office efficiency. A broken copier leads to prolonged office downtime, but a good copier service provider can ensure your office copier has little to no down time. Let our thirty years of experience help you. Whether you have a small home office or large corporate office with a fleet of copier systems, we can perform emergency repairs reasonably and keep the office running smoothly. We are an independent service dealer, with no obligation to sell marginal equipment. We service what we sell. In fact we still have relationships with our original customers. Our technicians are trained by manufactures, our services are more reasonably priced. Our goal is to provide you with the best prices, fast response, accurate repair, and outstanding customer service. We sell, repair & service office equipment, copiers, laser printers in the Maryland, Virginia, & D.C. Metro Area for over 24 years.With more than 24 years of experience, we can analyze your needs and provide you with a more cost effective solution. 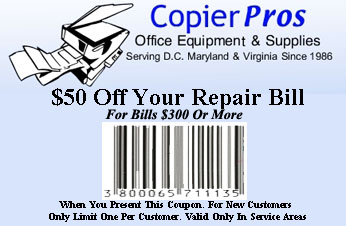 Our team is the most trusted office equipment provider in Maryland. We let our decades of experience and customer satisfaction speak for itself! Multifunction copier fax scanner printers. We service what we sell and what others have sold.